Arguably one of the most luxurious hotels on the island, Essque Zalu Zanzibar has been awarded numerous high quality travel industry awards. The hotel is the winner of the Tripadvisor 'Travelers Choice 2016' Award and it has been nominated for the 2016 World Luxury Hotel Awards. 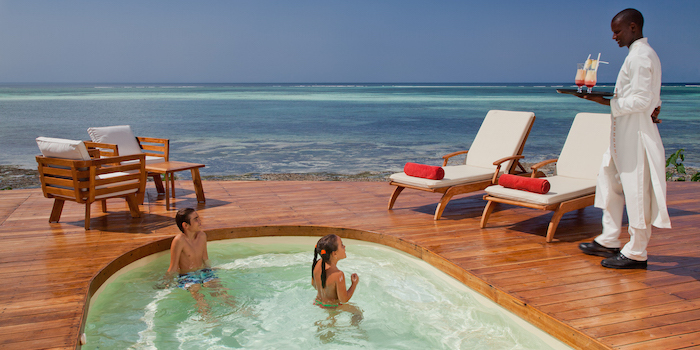 Enjoy your own personal piece of paradise and create unforgettable memories at Essque Zalu Zanzibar. Essque Zalu Zanzibar welcomes guests to their own private, capacious suites which are sheltered under a spectacular, traditional, Makuti roof. The suites are airy and adorned with ornate artwork which proudly displays the talents of local artists. Guests can choose to stay in one of the 40 suites or they can opt for an extra spacious villa. All suites have phenomenal views, either of the verdant, tropical hotel gardens or of the expansive Indian Ocean. Guests can expect enormous master bedrooms, a beautiful lounge, and, depending on the villa, either their own private balcony or terrace which both boast extraordinary views. Guests are treated to a private massage area, luxury solar heated showers, as well as an exclusive swimming pool. With lavish villas and direct access to the beach, Essque Zalu Zanzibar truly has it all. Essque Zalu Zanzibar’s spa offers diverse massages and beauty treatments, all designed to help guests de-stress so that they can enjoy the wonders of Zanzibar. The spa prides itself on its sauna, steam room, and hydro shower room. Treat yourself to an African facial or a traditional Singo Body Scrub with aromatherapy. Or engage in the Maasai Ritual, aimed at taking guests on a journey of renewal. Why not indulge in a tailor-made cocktail after your rejuvenating spa treatments? The hotel boasts three restaurants and three bars. Enjoy refreshments, snacks and cocktails at either the 1506 Bar and Terrace, The Jetty, or The Baobab Bar. Spoil yourself to an exquisite fine-dining experience at A La Carte or treat your taste buds to awesome Arabic cuisine served at The Jetty. Essque Zalu Zanzibar is well known for its amazing activity centre which offers scuba-diving, jet-skiing, and parasailing. These activities are bound to appeal to the thrill-seeking holiday-maker. The hotel is easily one of the best places in Zanzibar for families as it has an excellent club for children, allowing parents to enjoy a worry-free and relaxing holiday. 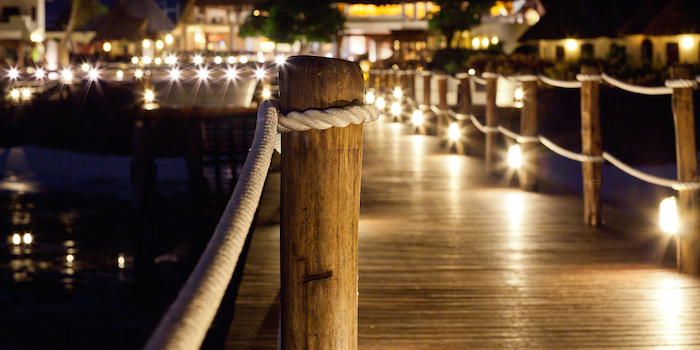 Sip cocktails by the pool or take a stroll down the magnificent wooden pier which spreads out into the ocean. For those who want to have a true Zanzibar adventure, why not visit the bustling markets in the village of Nungwi or the majestic Mount Meru? Essque Zalu Zanzibar is approximately an hour-long drive from Zanzibar International Airport. June to October is the winter/dry season. This is when the bush is less dense and animals are much easier to spot as they generally congregate near waterholes. There isn’t much rain at this time of year, the skies are blue and there are a lot less mosquitoes than in the summer months. It is also the best time to see the incredible wonder that is the great wildebeest migration, although parks are generally busier at this time, as a result. For more on the migration click here. November to May is Tanzania’s wet season. It is also the low season, so the reserves are less crowded and rates are lower. The landscape is lush and green and many newborn animals can be seen. The plains are alive and many migratory birds are visiting. Although rain is heavier during this time it is only between March and May that it can sometimes be cloudy and continuous. Exciting water activities - from snorkelling to jet-skiing. Outstanding spa and beauty treatments. June to October is the winter/dry season. This is when the bush is less dense and animals are much easier to spot as they generally congregate near waterholes. There isn't much rain at this time of year, the skies are blue and there are a lot less mosquitoes than in the summer months. It is also the best time to see the incredible wonder that is the great wildebeest migration, although parks are generally busier at this time, as a result. For more on the migration click here. November to May is Tanzania's wet season. It is also the low season, so the reserves are less crowded and rates are lower. The landscape is lush and green and many newborn animals can be seen. The plains are alive and many migratory birds are visiting. Although rain is heavier during this time it is only between March and May that it can sometimes be cloudy and continuous. Arguably one of the most luxurious hotels on the island, Essque Zalu Zanzibar has been awarded numerous high quality travel industry awards.. Enjoy your own personal piece of paradise and create unforgettable memories at Essque Zalu Zanzibar.Contact Iconic Africa now and let us craft the ultimate East African adventure for you.